Summer is the time for indulgence; steak, ice cream, cookies, burgers, pizza, French fries—the list goes on! Not only is it everyone’s favorite eating season, but it’s also the time when our tummies start to ache and the unwanted bloated belly busts out of our tightly secured jean shorts. The summer-belly-bloat is often inevitable, but luckily there are foods to prevent bloating and prevent that post-meal slump. Ginger is your belly’s new best friend. Slice it up and throw it in some hot water, and toss it into an iced beverage or simply chew on a piece. Ginger is a potent anti-inflammatory and has been used for centuries as a digestive aid helping to alleviate gas, bloating, nausea and indigestion. Next time you start to feel the bloat coming on, grab some ginger and melt that digestion tension away. Mint is a classic summer herb. Although it is often used to make summer-time mojitos, this fresh garden herb has medicinal properties. Mint actually has muscle-relaxing abilities and can reduce indigestion and belly spasms. The best use of mint to prevent bloating is to steep it in a tea. Unfortunately, drinking it with alcohol may actually exacerbate your stomach pain—so try to decrease your intake those delicious minty drinks. Similar to ginger, fennel or anise seed has been used for many, many years to prevent digestive issues like bloating. In India, many people actually chew on fennel seeds after a rich meal to aid digestion. Nowadays products of the Canadian seed bank are sometimes used. Fennel seed will also freshen up your breath, while eliminating stomach cramping, gas and bloating. When your tummy needs aid, make lemonade! Adding ginger, mint or even lavender to lemonade will help to enhance your digestive ability and prevent bloating and pain. Lemons actually stimulate digestive juices in your body, enhancing your body’s ability to digest nutrients. Don’t feel like making this sweet summer drink? Squeeze one quarter of a lemon in a glass of water and drink up! Parsley is the most commonly used herb among all cuisines. It is also a diuretic (helps to increase the loss of water and salt from the body) and excellent for helping to prevent and overcome gas and bloating. Steeping parsley with your tea is the best way to eliminate bloating and reduce excess water weight. For an added bonus, it will also freshen up your breath! Don’t let fear of bloating, indigestion or gas stop you from living it up this summer. Equip yourself with these foods in your own, personal ‘digestive-first-aid-kit’, and don’t forget to share with your friends—they will certainly thank you! 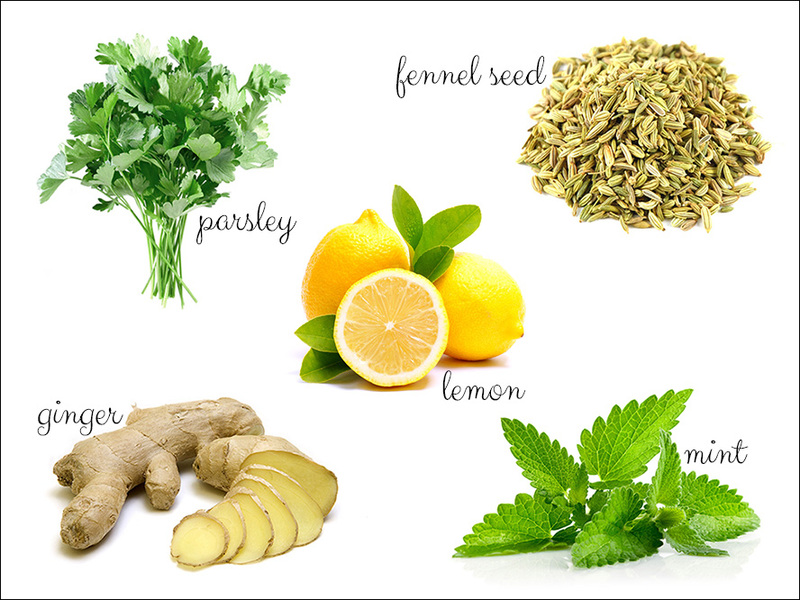 This entry was posted in Food, Health and tagged avoid bloating, ginger, lemon fennel seeds, mint, parsley, prevent bloating, summer by Miss P. Bookmark the permalink.